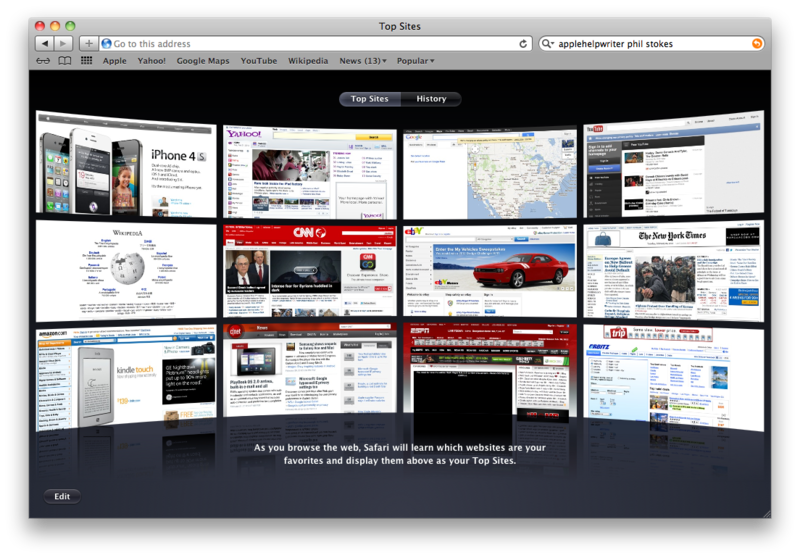 If you are fed up with the ‘Top Sites’ feature in Safari 5, here’s how to remove it. 1. 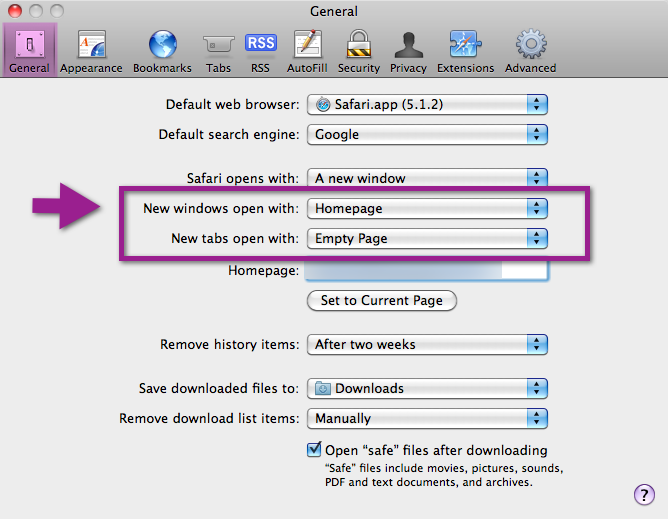 In Safari > Preferences > General, change ‘New windows open with’ and ‘New tabs open with’ to either ‘Homepage’ or ‘Empty page’ (as you prefer). 2. In Safari > Preferences > Bookmarks, uncheck ‘Include Top Sites’. 3. 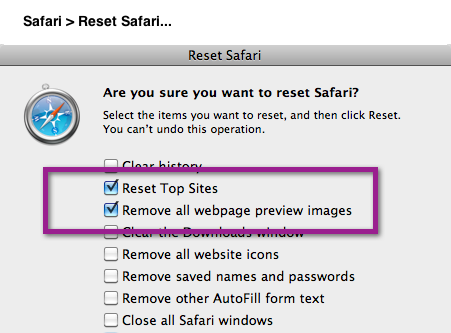 In Safari > Reset Safari…, check ‘Reset Top Sites’ and ‘Remove all webpage preview images’. 4. Go to your home folder Library (~/Library) by clicking on the Folder icon in the dock, pressing ‘shift-command-g’, and typing ~/Library in the box. 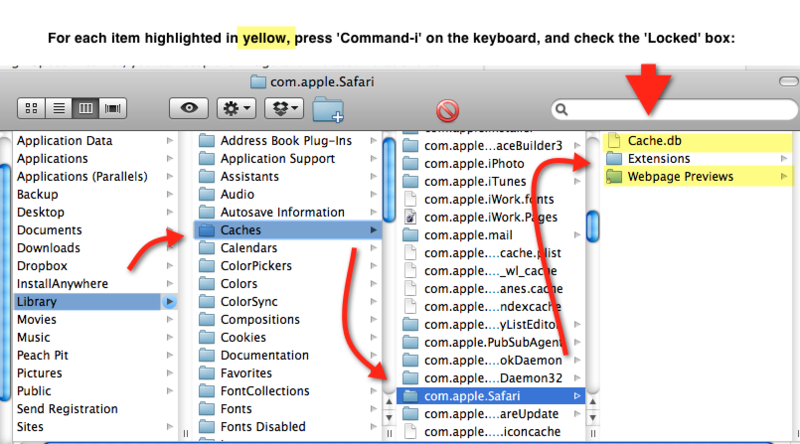 Navigate to Caches > com.apple.Safari. 5. Click once on the Cache.db file. Hit ‘command-i’ on the keyboard. In the Get Info panel that opens, check the ‘Locked’ box. Close the panel. 6. Click on the Webpage Previews folder in com.apple.Safari and press ‘command-i’. Check the ‘Locked’ box. Close the panel. 7. 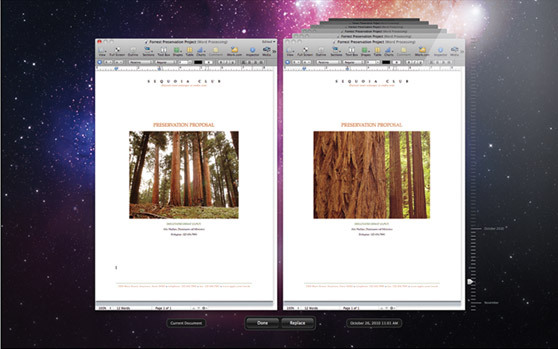 Navigate back to Caches > Metadata > Safari> Bookmarks. Go into the Bookmarks folder, hit ‘command-a’ and then ‘command-delete’ to send all the selected files to the Trash. 8. With the Bookmarks folder selected in Finder, press ‘command-i’ and check the ‘Locked’ box. Close the panel. Security in OS X Lion is a big problem that not many people are aware of, and here’s why: your Lion computer contains the install/recovery disk on the internal drive. That means anyone with a basic knowledge of Mac and Lion can start up your mac and reset your passwords, thereby accessing your user accounts and all your personal data. The same trick can help kids easily get round restrictions applied through OS X’s ‘Parental Controls’ feature. How is this possible, you may ask? First, a little history. 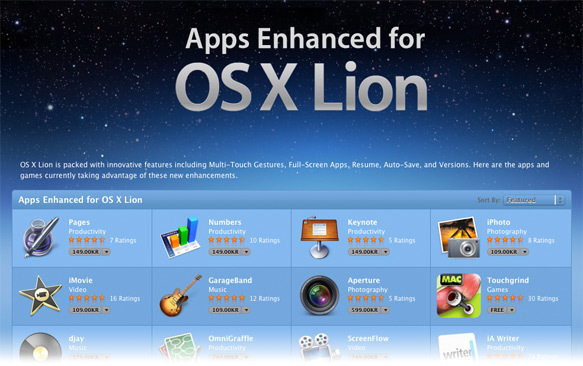 Among the 250 changes vaunted about Lion over its predecessor, Snow Leopard, there is one that is widely known but whose implications are rarely pointed out: you download the OS rather than install it from a disc. In the past, if your OS went bad and needed to be recovered, or you forgot your admin passwords, the simplest answer was to insert your install disk. From that, you could restore the OS and reset your passwords. That made your Mac a little safer (though not entirely safe) so long as your disc was kept somewhere physically different from your computer. With Lion having no install disc, Apple had to find an answer as to how to provide the recovery option. The solution was to install a Recovery partition on the same disk as the operating system itself. In the event that the OS goes bottoms up and needs to be recovered or re-installed, you just restart your computer holding down the ‘command’ and ‘r’ keys to access the Recovery partition. So far so good, but likewise, just as with the old DVD install discs, you — or anyone else — can also reset the user account passwords from the Recovery partition. That means your passwords are effectively useless. Anyone who wants to hack your user account just has to restart your Mac holding down ‘command’ and ‘r’ and then use the built-in Password Utility to make new passwords for your accounts. Now I’m not going to tell you quite how to do it (you do need a little knowledge to get the user account names and know how to do the reset) but it is widely publicized elsewhere, and indeed even in Apple’s own online documentation (so if you really want to know, google is your friend or follow some of the links in this post…). What’s the answer to this security nightmare? Here’s one thing that’s NOT the answer but which I have seen widely touted: setting a firmware password. If you’re not familiar with the concept of the firmware password, don’t worry. It is practically useless, since anyone can reset that simply by taking off the back of your computer, and then pulling out and then putting back in one of the memory chips. Apple, of course, thought about this problem. Their own solution is to encourage you to use FileVault 2 (FV2) to encrypt all your data. Indeed, this is the BEST solution. Without your password, no one can access the disk on your computer no matter what they do (and that includes YOU if you forget it…). However, there are a couple of drawbacks to FV2. One is that it requires extra disk space, and if you have more than one partition on your hard drive, or a lot of data, and little space you may not be able to encrypt and decrypt your data. The other drawback is that FV2 places a little extra wear-and-tear on your hard disk (though that may be negligible given the security pay off). Using FileVault 2 is really the only security option if you’re using Lion. However, if you don’t have the space for it, there is a ‘second-best’ strategy (see below why it’s only ‘second best’), and that is to remove the recovery disk and use a clone as your recovery option instead (WARNING: the Recovery disk is required for FileVault 2, so by removing it you will also remove the ability to use FV2). 1. Clone your current system to an external disk using Carbon Copy Cloner. This will clone your entire system exactly as it is now, but it will not copy the Recovery disk. 3. Open Disk Utility.app (Applications/Utilities/Disk Utility.app). In the menu bar of Disk Utility, choose Debug > Show Every Partition. 4. In the left-hand pane of Disk Utility, you can now see the Recovery HD. Click on it. Then click on the Erase tab on the (larger) right-hand pane. Click the Erase button down there on the bottom right. Now you can use your bootable clone as your recovery disk if your OS becomes corrupt and no one can boot up your computer with ‘command-r’. If you keep the clone backed up on a regular incremental schedule (you can choose anything from once an hour, once a day, week, or month), you can simply restore a corrupted internal disk to exactly the same state as your last backup. As alluded to earlier, it is still possible for advanced users to start up your mac and reset the password without the Recovery partition (this was also true in Snow Leopard even without the install disc). In fact, what this procedure does is give your OS X Lion installation the same security level as an OS X Snow Leopard installation, which is not actually that great, but better than Lion with a Recovery disk! Also, if you are storing highly sensitive data, don’t neglect the fact that someone who has complete unfettered access to your hard drive could even remove the disk and recover the data using special software. The short story is if you want to be absolutely certain that your data is secure, FileVault 2 is really your only option. — Hold down the ‘sleep/wake’ button (top right, back edge) for about 5 seconds until the slider appears. Release the ‘sleep/wake’ button. Now hold down the ‘Home’ button (bottom front, centre) until you see your Home screen. — Hold down the ‘sleep/wake’ button for about 5 seconds until the slider appears. Slide it to ‘Off’. Then hold it down again until the Apple logo appears showing that the iPad is restarting. — Hold down the ‘sleep/wake’ button AND the ‘Home’ button simultaneously for about 10 seconds or until the Apple logo appears. *For more serious problems with your iPad, such as continual restarting or no home screen, have a look here. If you’re working with large files in Keynote, Pages, Numbers or other Versions-supported programs, and making multiple changes at regular intervals, Versions could just be eating up your hard disk and causing a big-slow down in your work. Click the padlock at the bottom of the next box and enter your admin password. If you are requested to set a password for it, set the same one as your Admin password (this ensures you won’t forget it). Log out through  > Log out (username), then log back in with user ‘root’ and the password you just enabled. Now go look in the root directory of your hard disk. You should see a greyed out folder called ‘DocumentRevisions-V100’. If it has a ‘no entry’ icon on it, click the folder and press ‘Cmd-i’ on the keyboard (or right click the folder and choose ‘Get info’). Scroll down to the bottom of the box, click the padlock, and enter your root password if necessary. Change all the permissions to ‘read & write’, and click on the ‘gear wheel/cog’ and choose ‘Apply to enclosed items’ if it appears. Choose ‘OK’ in the warning dialogue box. Now you are ready to go and look inside the Versions directory. I recommend you have a nosey about and check the file sizes both of the folder itself and of the individual contents. Now, here’s a warning: you can’t just delete some of the contents in the folder. If you do, in about 24hrs Lion will see that the folder is corrupt and mark the whole thing as ‘bad’ and make a new Versions (.DocumentRevisions-V100) folder. What this means is that you will lose access to Versions in the UI, but you won’t get your disk space back as it won’t delete the ‘bad’ folder. The only option is to either lock the thing back up and leave it alone, OR delete the entire .DocumentRevisions-V100 folder with all its contents. Restart your computer logging in as your usual user. Lion will make a new, empty DocumentRevisions-V100 folder to replace the one you deleted and start filling it up with versions you make from then on. You’ll have reclaimed your disk space (and removed all your previous versions), but you’ll need to keep doing the same process at regular intervals. a. No, this does not affect your original saves or any duplicates. Only the versions. b. Messing about as a root user can have serious consequences if you mess with other stuff. Do as the instructions say and nothing else unless you know what you’re doing. After you’ve deleted the Versions folder and emptied the Trash, go back to Directory Utility > Edit and disable the root user. c. To stop seeing the hidden files, type the same command as given in 1. above into Terminal, but change ‘YES’ to ‘NO’. Don’t forget to do the ‘killall’ command afterwards.